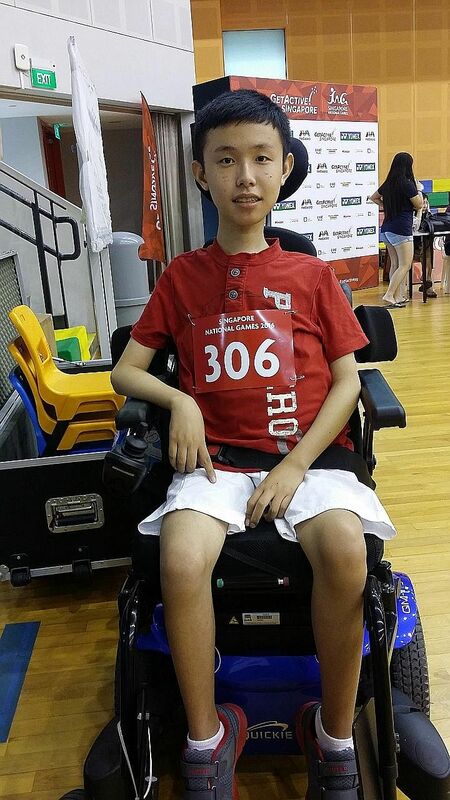 Gareth Ho, 17, looks like any normal teenager, but gets around in a motorised wheelchair. Some people find this unacceptable. A teenager once spat into his hand and wiped it on Gareth's arm at Sengkang LRT station. "I felt shocked and very angry," he said. And once in a while, strangers tell him that, at his age, he should be walking around instead of being in a wheelchair, and he has to explain his condition to them. They did not realise that he has muscular dystrophy, a disease that has sapped most of the strength from his limbs, sparing only his wrists and fingers. Despite these bad experiences, he has met more kind people than unkind, and is driven by an aspiration to be a Paralympian playing boccia, a ball game for people with severe physical disabilities. Gareth is now one of three "ambassadors" with physical, sensory or intellectual disabilities whose stories will be told in an upcoming mass media campaign, which includes online videos and stickers in MRT trains and stations. It is part of the larger See the True Me movement, organised since last year by the National Council of Social Service (NCSS) and the Tote Board, with the aim of shifting public attitudes towards disabled people from acceptance to inclusion, and see their strengths rather than disabilities. Members of the public polled in an NCSS study earlier this year described being inclusive towards disabled people as "tolerant", "accepting" and "helping them when needed", but the council said inclusiveness goes further, to studying, working and living together with people with disabilities. NCSS' campaign this year will also feature largely free events organised by 11 social service organisations over the next two months. These include talks to raise awareness, sign-language classes, chat sessions with people who have disabilities, and sporting activities like dragon boating. NCSS chief executive Sim Gim Guan said: "Inclusion is seeing persons with disabilities as persons first, and not defined by their disability. We need to move beyond pity and tolerance to truly including persons of different abilities in our lives." And Gareth reckons that disabled people like himself have a part to play too. "I want to inspire other people with disabilities to... go out and make friends, and not always stay at home and hide from society," he said.